An angry man smashed his partner’s fence with a chair and destroyed a mirror and damaged three doors at her home after a dispute. Chesterfield magistrates’ court heard on Thursday, May 3, how Craig Merrett, 30, of Front Street, Fritchley, went on the rampage at his partner’s home on Rutland Avenue, Waingroves, Ripley. Mrs Haslam added that the complainant decided to meet a friend and while she was away she received 20 missed calls from Merrett before returning home at 3.45am and when she could not find a key she phoned the defendant. However, Merrett was not happy with the complainant, according to Mrs Haslam, and he took a chair from the back of the property and used it to hit a fence and the complainant could hear further banging after he went back inside. Mrs Haslam said there was punch damage to a living room door and a bedroom door and a back door was damaged and a mirror had been destroyed. Merrett told police he had been upset because his partner had been out so long and he thought she was lying about where she had been but he accepted damaging the property. He pleaded guilty to causing the damage after the incident on April 22. Defence solicitor Kirsty Sargent said Merrett wants to pay for the damage he caused and he had acted out of character because he had consumed too much alcohol. 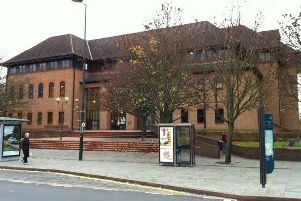 Magistrates fined Merrett £400 and ordered him to pay £505 in compensation, a £40 victim surcharge and £85 costs.